I suppose that in some ways it was inevitable that GoldenEar Technology could not rest on its laurels in producing the Triton One—a truly excellent speaker at its price of $5000 a pair. GoldenEar’s corporate slogan may be “We make the high end affordable,” but almost all of the companies that produce high-end audio products are led by audiophiles. Even those that focus on the affordable side of the high end can rarely resist trying to introduce reference-quality products. Fortunately for the vast majority of audiophiles, GoldenEar stayed true to its heritage. The announcement immediately went on to state a very different goal: To create “a loudspeaker destined to raise the bar and set a completely new performance standard for reasonably priced, affordable loudspeakers.” “Reasonably priced” also actually turned out to be reasonably priced—well, reasonably priced by high-end standards. The GoldenEar Reference costs $4250 each, or $8500 a pair. When the review pair arrived, its sound sent a far more important message. The Triton Reference is a major improvement over the Triton One, and is a truly excellent speaker for the money. 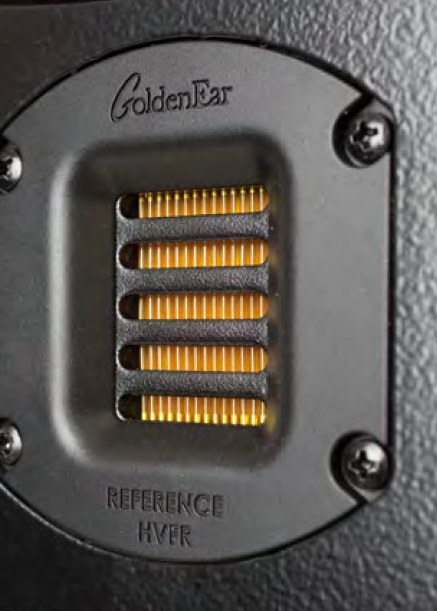 I’ll leave judgments about a “completely new performance standard” to GoldenEar’s marketers, but the Reference does everything exceptionally well for a speaker near its price range. It offers a remarkable amount of transparency, life, and soundstage detail along with some of the best-integrated powered subwoofer performance I’ve heard at anything like the price. Before I get to the sound and the music, however, I should mention the sidebar to this review. I normally try to provide a detailed technical description of any product I review, but in this case, I pushed Sandy Gross, the head of GoldenEar, into explaining the design rationale behind the speaker. I also asked him to focus on the tradeoffs that he had to make relative to those six-figure super-references, and on the specifics of the improvements over the Triton One and the extent to which they involved any diminishing returns in value for money, and the fact that a pair of Triton References costs 70% more than a pair of Triton Ones. Rather than simply do an interview, he took the time to provide a detailed response, and one that does a great job of describing the goals behind the new Triton Reference and its technical features. I’m still struggling with his nicknaming the speaker the “T Ref,” and I can’t quite shake the image of a new version of Jurassic Park where a “T Ref” starts eating the reviewers at an audio show. Nevertheless, his explanation of the speaker is objective enough to provide an exceptionally sound picture of the design rationale behind the Triton Reference, the changes in its components and technology, and the how these changes are intended to affect the music. If anything, I think Sandy downplays the importance of one key aspect of the Triton Reference. The Triton One covered its body in fabric in order to deliver exceptional sound for the money. The Triton Reference has wood sides and a matching base that are finished in a glossy piano black. It is a substantially more attractive speaker, has no techno-geek visual features, and is 58" tall and 22 ¼" deep, but only 6 ¾" wide at the front and 13 ½" at the back. Form follows function in a really attractive way, and in visual terms it’s a speaker a wife or partner can easily live with.